BT Sport chooses LiveU cellular uplink video solution. 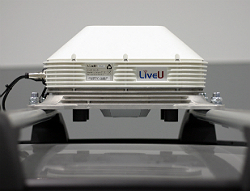 New Jersey, September 2014: LiveU (www.liveu.tv), the leader in portable live video acquisition, contribution and management solutions, has announced that BT Sport has chosen LiveU’s market-leading cellular uplinking technology to create Europe’s first cellular newsgathering (CNG) fleet of vehicles. The deal has been led by LiveU’s UK partner Garland Partners Ltd.
BT Sport has worked with LiveU and Garland Partners to equip three Vauxhall Astras with the LU500 and Xtender remote antenna technology. 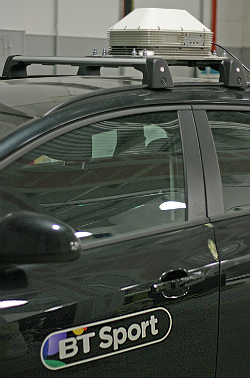 Each LU500 backpack unit can be connected wirelessly (up to 1,000 ft/300 meters) or via Ethernet to the Xtender that sits on top of each vehicle. The combined power and signal robustness achieved, even in congested areas like sports stadiums, is unrivalled in the market and gives the broadcaster absolute confidence. The units can be accessed and controlled remotely via LiveU Central, the company’s management platform that allows full control and monitoring of the LiveU units and content via any browser-supported computer or tablet, from anywhere around the world. LiveU’s LU500 has taken the cellular bonding market by storm with its next-generation technical strength and outright performance in the field. Weighing around 1 kg (2.2 lbs), this small-sized unit is powered by LiveU’s new multi-processor video encoding engine and fourth-generation patented bonding algorithms providing previously unseen levels of signal robustness in an easy-to-carry unit. The level of video quality and reliability delivered by LiveU’s technology has brought cellular uplinking into the mainstream of sports coverage, adopted by sports networks, organisations and teams worldwide, most notably in the US and Europe, for high-profile sports events. LiveU owns the patent for cellular bonding for remote newsgathering in the US and other countries. All LiveU products are based on this fourth-generation patented technology.